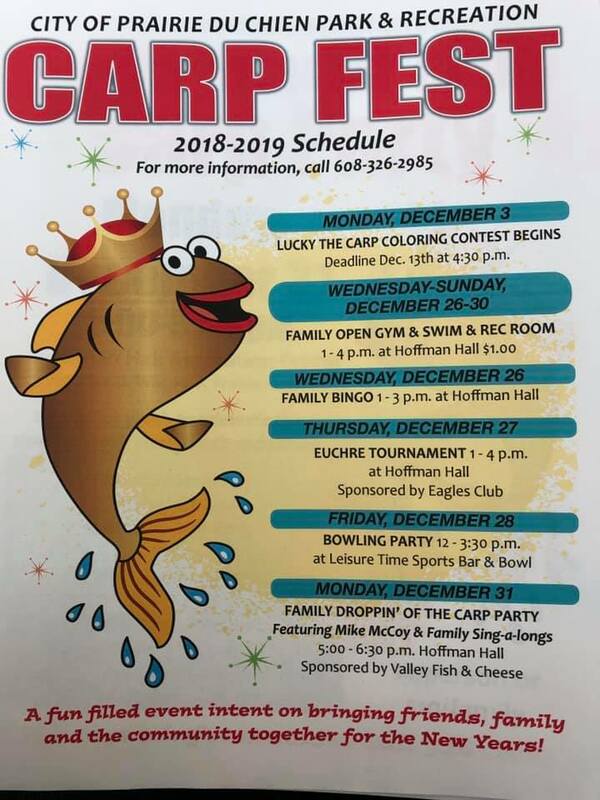 Whether you believe the number 13 is lucky or not, the 13th annual Droppin’ of the Carp at Lucky Park in downtown Prairie du Chien could bring you a little good fortune in the new year. This is only if you buy into the superstition and plant a kiss on the world-renowned local fish, “Lucky, the carp,” on New Year’s Eve Tuesday night. It would make for a good photo opportunity, if nothing else. Of course, there’s much more to the Droppin’ of the Carp and Carp Fest than the lowering of “Lucky,” but the famous frozen fish is certainly the most felicitous aspect of the entire celebration. Between 2,500 and 3,500 fans attend the carp drop from year to year, and this holiday, despite a chilly New Year’s forecast, an enthusiastic crowd is expected yet again. The celebration will kick off at Lucky Park at 9 p.m. with the area’s largest music, entertainment and light show, sponsored by Twisted Vision (Nick and Nate Gilberts and Shawn Redman). 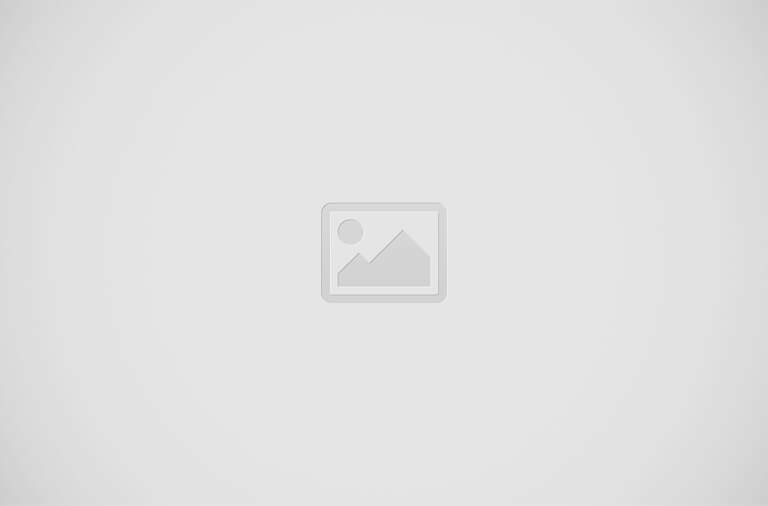 “They do a nice show; they really get the crowd involved,” Nelson said. Throughout the evening, prizes will be bestowed upon some of the most spirited event-goers. So be sure to dress to impress. Droppin’ of the Carp T-shirts and hats will also be for sale. A huge bonfire will be going and Twisted Vision will continue generating excitement until the carp is lowered. The festivities conclude around 12:30 a.m. on New Year’s Day 2014. Carp King and Queen Ken and Jan Meyer, and Carp Family, the Randy Paske family, will reign over this year’s event. In addition, Golden Carp Sponsors who give toward the festival will have the option to designate members of their businesses to join the prestigious Carp Court, which is also recognized at the carp drop. At the stroke of midnight, “Lucky” will drop, fireworks will light up the sky and party-goers will ring in the new year with noisemakers, kisses, toasts and good cheer. Highlights of the event will also include the first Pledge of Allegiance for 2014 as well as the singing of “God Bless America” as everyone remembers our troops and all that they have sacrificed. 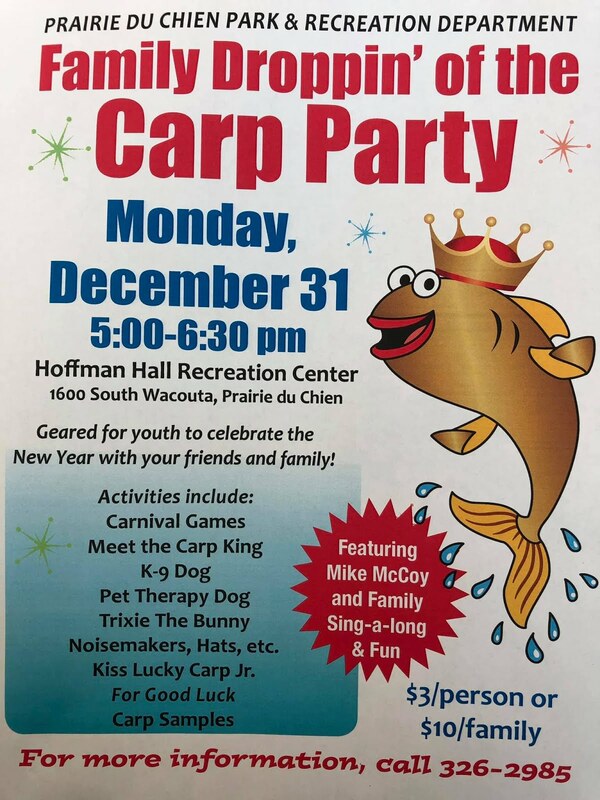 Carp Fest will end on Wednesday with the New Year’s Day Rotary Club Breakfast at Huckleberry’s Restaurant in Prairie du Chien, from 9 a.m. to 1 p.m. The Carp King and Queen and Carp Fest Committee will show up around 10 a.m. for one last hoorah. The public is welcome to attend the breakfast. “The transition of the Droppin’ of the Carp that started 13 years ago—when we thought a few dozen people would show up—has been very remarkable,” Nelson said. Four years ago, Parks and Recreation Director Mike Ulrich approached Nelson about making the carp drop into more of a week-long festival. Nelson agreed with the idea. 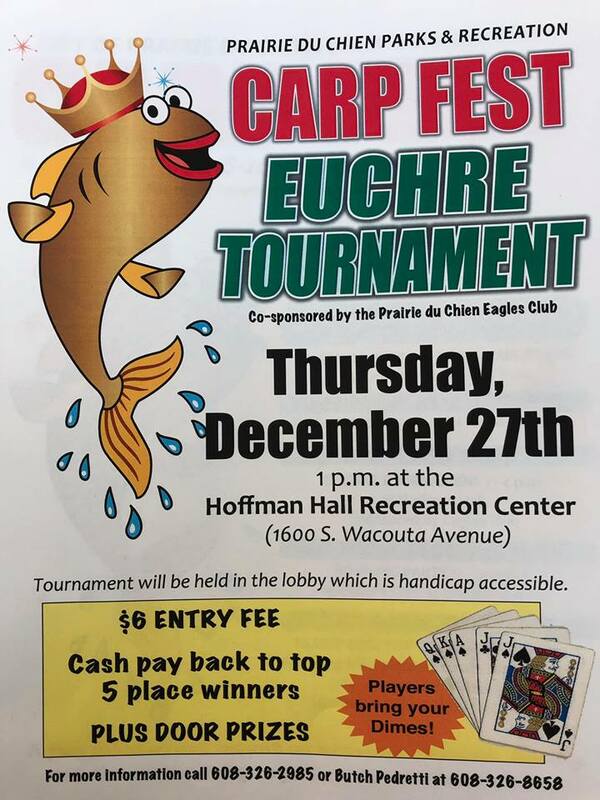 Now, thanks to the addition of a Carp Coloring Contest, Hoffman Hall activities, a Carp Bowl football game (canceled for 2013), a Bowling Party, Youth Ice Fishing Derby, Teen Dance, Euchre Tournament and more, it has developed into that. “The event has really grown into a holiday celebration that gives people something to stay awake for, that’s personalized and local,” Nelson explained. “It gives people some time to spend with their families, friends and neighbors, and the opportunity to meet new friends too. It also fills them with hope for good luck and good fortune in the new year. Speaking of “Lucky,” Nelson said this year’s illustrious carp was pulled from local waters before they froze. “Lucky” has been locked away safely in a vault until now. Commercial fisherman Mike Valley has spiffed her up for the New Year’s occasion. According to Nelson, the tradition of kissing “Lucky” started in the early years of the carp drop when “some young girls from out of town asked if they could kiss her.” With the advent of digital cameras and sharing on Facebook, pictures of attendees kissing “Lucky” have grown more popular and helped to illustrate the event’s unique charm to people all over the world. So dress in your warmest layers of clothing, underneath your most creative, colorful and amusing attire, and find your way to Lucky Park this Tuesday night for an event you won’t soon forget.